This was a wonderful romantic suspense story that kept me guessing all the way through. The story has lots of twists and turns with a great blend of mystery and romance. The characters are strong and well developed and the story flows beautifully. Sloane McBride left her hometown of Millcreek, Texas ten years ago. She simply couldn't live with her father any longer. So she left him as well as Micah, the only man she's ever really loved, behind and started life fresh in New York City. Now she's returned and she's determined to get to the bottom of her mother's murder. I highly recommend this one. I really like the twist & turns of this book. Brenda has written a great stand alone story. The characters are really interesting. I wanted to know what was going to happen. This book opens with a quick burst of energy. The pace is fast and strong with mind blowing twists. A real puzzler full of surprises!! Sloane McBride was five years old when her mother disappeared. Even though her father claimed her mother was unhappy and left to go on her own, Sloane always felt foul play took part in her mother’s disappearance. Now twenty three years later, Sloane has returned home much to the dismay of her father, brother and her once best friend who got pregnant to Sloane’s old boyfriend after she left. Now this friend has supposedly re-befriend Sloane....BUT who can Sloane really trust as she digs into the mystery regarding her mother disappearance. Plenty of drama, intrigue, tension, suspense and thrills and chills. You get to accompany Sloane on her quest due to the author’s well written story. The story intensifies from the beginning to the end as dark secrets are revealed. 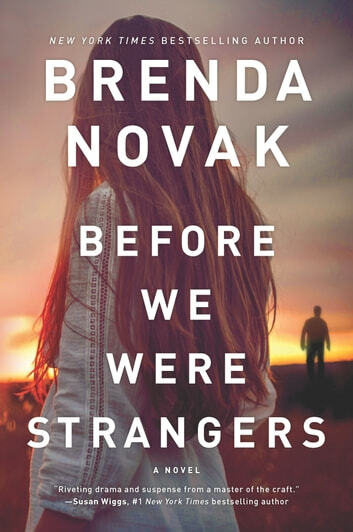 I volunteered to read Before We Were Strangers. Thanks to the author for the opportunity. My opinion is my own. Sloane McBride was 5 years old when she woke up and heard her parents arguing again. Then she heard a loud thump. The next morning her mom was gone. All her life Sloane thought her dad may have killed her mom. When she turned 18 she high tailed it out of town, leaving her family, her boyfriend, Micah, and her best friend, Paige to get away from it all. During her time away, Micah ended up marrying Paige and they had a son. Now they have been divorced for 2 years because Micah was still in love with Sloane. Sloane went on to become a highly successful model and is very well off. It's been ten years since Sloane left Millcreek, TX but now she is determined to find out what happened to her mom. As Sloane starts digging into the truth, weird, interesting facts come to life. Since Sloane's dad is the mayor of Millcreek, she is not getting much help from local people...they are all too afraid of her father. Imagine her surprise when Micah steps forward and offers to help her. As they spend more time together, their feelings for each other are even stronger. Together they finally unravel everything that had happened to her mom. Sloane is in for a big surprise when she finally ends up learning the truth. Throughout the way, she starts to realize that people that seem like friends, really are not and that people she thought were enemies were actual friends. This is one of those stories that has wonderful characters, is beautifully written and keeps you in such suspense that you cannot put this book down. Just when I would think the story was going in one direction, it changed directions into something else. After all is said and done, Sloane and Micah will get their very deserved happy ending! Fantastic!! This book drew me in immediately and didn't let me go until the last page. With so many twists and turns throughout this romantic suspense it will keep you guessing. Sloane has returned home after being gone for ten years to determine and uncover the murder of her mother when she was five years old. She soon reconnects with her one true love, Micah. Loved this book,full of romance and suspense. Strong likable characters. Loved Micah!! I highly recommend this book! !